This coin honours one of the greatest of Italy’s sons, Galileo Galilei. Galileo who is regarded by many as the father of modern science won renown as an Astronomer, Physicist and Mathematician. Coming into conflict with the church because of his assertion that the earth revolves around the sun, he narrowly escaped being burnt at the stake and spent the last years of his life under house arrest. A bust of the great man dominates the inner circle. At centre right is a depiction of the telescope with which he made many of his important astronomical discoveries. Near the edge of the inner rim one can see – at four o’clock the mint mark “R”, at five o’clock the initials of the designer “C.M.” and at eight o’clock the nationality “RI”. 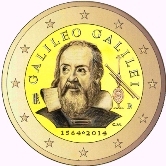 As a matter of interest Galileo is also honoured on a commemorative coin of San Marino in 2005.